Successfully Added 72 Key Keyboard PC - Windows 10, Intel Bay Trail CPU, 2GB RAM, 32GB Memory, 1TB HDD Support, Bluetooth (Black) to your Shopping Cart. This 72 Key keyboard PC lets you turn any monitor into a PC and has everything you need built right in with keyboard and touch pad so it's ready to go right out of the box. 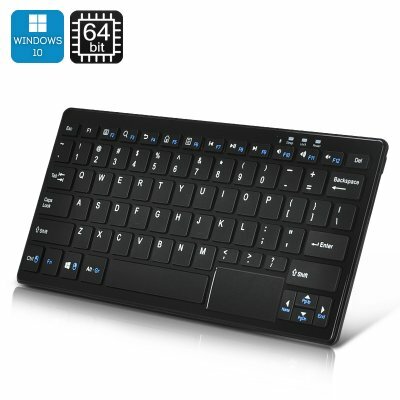 You can be forgiven for thinking that this is just a 72 key mini keyboard but after closer examination you would notice the HDMI, VGA, USB and Ethernet ports on the back which give away its true use as a powerful portable mini windows PC. The fact that this mini PC is housed inside its very own keyboard is fairly impressive and means that wherever you take it you have the keyboard and touchpad ready to go so you don't need to take any extra peripherals with you. by using the keyboard PC's VGA or HDMI port you can turn and monitor, screen, TV or projector into your very own computer. A revolutionary step for people who hot desk or wanting to work on business trips but don't want to cart a heavy laptop around with them. At just 310 grams it can slip in your bag and takes up virtually no space at all measuring less than 30 CM. With a Windows 10 operating system and powered by an Intel Z3735F Bay Trail processor with 2GB of RAM this PC is no slouch and is clocked at 1.33GHz but can easily utilize its Burst Technology to offer 1.84 GHZ of computational power through its quad core processor when needed. Thanks to Windows 10 you get all the favorite user tools and access to the full range of MS software suite letting you perform all the tasks you would expect from a desktop computer, but at a fraction of the cost and space. it has 32GB of built in memory and a micro SD card slot to add extra storage however should you need more then you'll be pleased to learn that this mini PC offers support for up to 1TB HDDs so your never short of storage options. The Wintel K3 Mini PC really delivers with its compact form, powerful performance and affordable price so whether you looking for a back to school computer, hot desking with easy or replacing the old laptop this windows 10 mini PC has everything you need and comes with a 12 months warranty, brought to you by the leader in electronic devices as well as wholesale Windows Mini PCs..
Amazing product. Truly licensed with windows 10. Really good for basic usage. Arrived in 2 days to Switzerland. Full Hd. Very happy with product. Only 32gb of ssd. Important to install ccleaner.